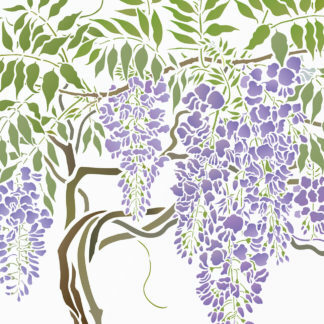 The Large Wisteria Stencil – is an extensive wisteria stencil theme pack depicting the overflowing, falling blossom and elegantly stylish leaves of early summer flowering wisteria. 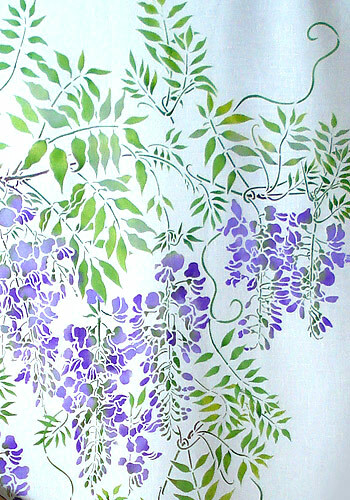 This three sheet wisteria stencil captures the detail of the many bloomed flower bunches, the tapering and entwining leaf groups and woody twisted stems. See size and sheet specifications below. 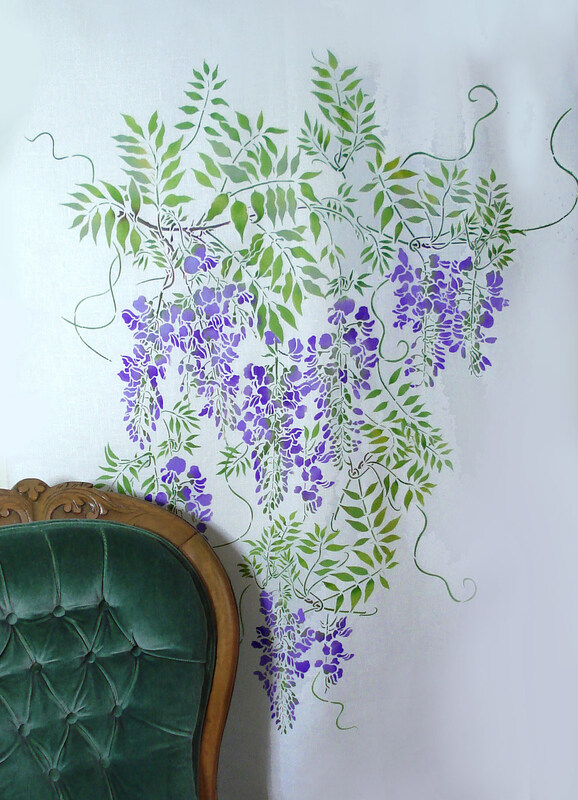 This bumper theme pack, with 22 different wisteria motifs is perfect for ‘growing your own design’ to fit all spaces – great for stunning decorative flourishes to walls and linens. 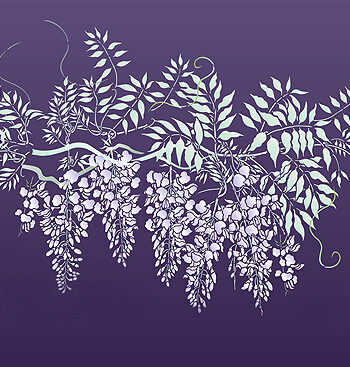 The Large Wisteria Theme Pack Stencil can also be used to add extra wisteria branches and details to our beautiful Wisteria Blossom Bough Stencil (see Wisteria Overview below). See techniques below if you are just starting out with this stencil. 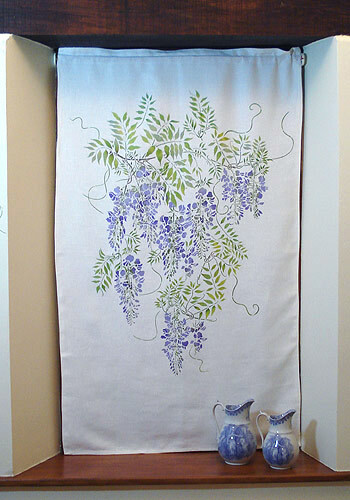 Above top – the different motifs of the Large Wisteria Theme Pack Stencil clustered in a hanging group, stencilled on high quality linen panel in Motif Fabric Paints Bright Purple, Cobalt Blue, Leaf Green, Light Lime, Turquoise Green and Terracotta. This effect is stencilled with our Stencil Sponges. 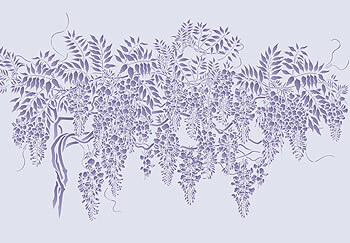 Above – the different motifs of the Large Wisteria Theme Pack Stencil can be arranged in any shape and layout. Here the different motifs are arranged in a tapered cluster grouping, stencilled in Plum Blossom, French Lavender (flowers) and Emerald Forest, Willow (leaves) Stencil paints. Above – the Large Wisteria Theme Pack is a dream for the experienced stenciller, as it can be adapted in so many ways to create a range of different effects. 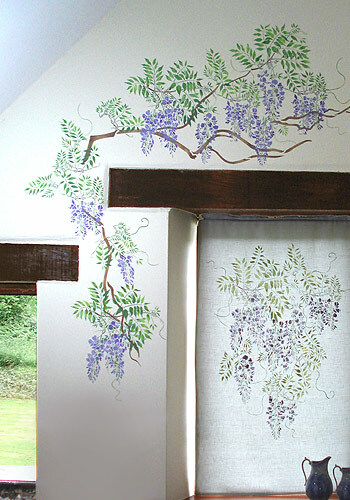 The different motifs can be used to create groupings of densely clustered flowers and leaves and more sparsely covered twigs and branches to emulate the natural growing patterns of the wisteria vine. 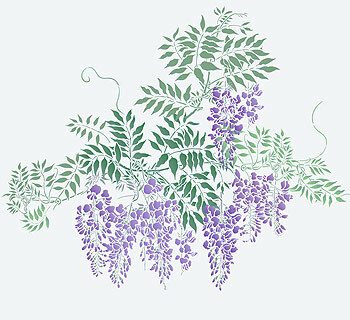 For a large fixed flowering wisteria bough see the beautiful Wisteria Blossom Bough Stencil and for a simpler, easy to use wisteria stencil see Small Wisteria Theme Pack, both of which can be used in conjunction with this stencil. 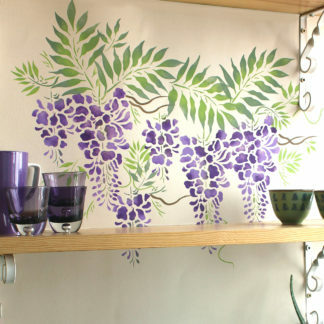 All three wisteria stencils can be used together. 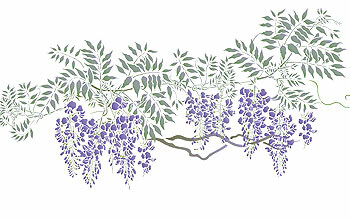 The flowers and leaves of all three wisteria designs are on the same scale, so can be intermixed. Small and Large Theme Packs refers to the size of the stencil sheets and number of motifs in each pack. 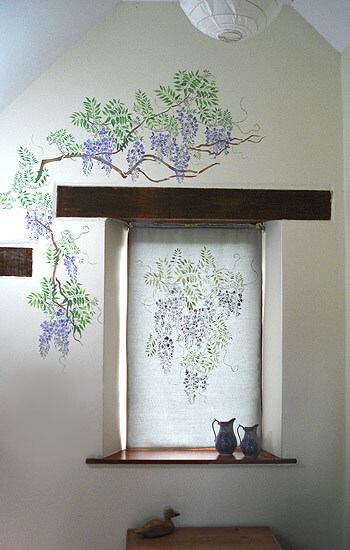 Above – the different motifs of the Large Wisteria Theme Pack stencilled around the oak beams of a barn conversion window, and on a linen blind, giving elegant interest to an otherwise plain space. The motifs of this theme pack lend themselves to being stencilled around doors and windows in this way, climbing in any chosen direction. Above – this effect brings a little of the outside inside, echoing the colours of nature. Walls stencilled in French Lavender, Forget-me-not (flowers), Ash Green, Verbena, Woodland (leaves and tendrils), Mocha and Chocolat Stencil Paints (branches). 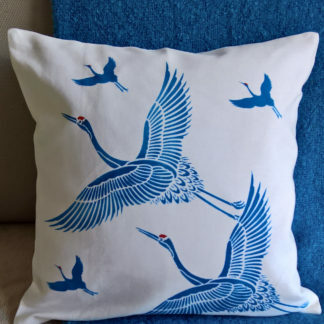 Linen blind stencilled in Motif Fabric Paints Bright Purple, Cobalt Blue, Light Lime, Leaf Green and Turquoise Green. Tips for stencilling this stencil. 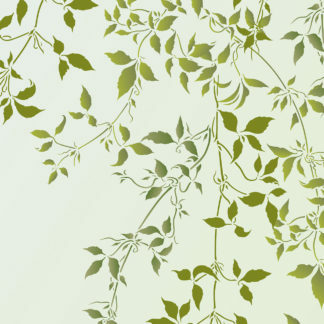 To create this effect with the Large Wisteria Theme Pack, create a framework of branches and twigs, stencilling these first in your chosen colours, then add the combined flower and leaf motifs a little above the branches. Then add the individual flower and leaf motifs, placing the flowers either on their own or in clusters around the other motifs to create the thick opulent flowering so common in climbing wisteria in bloom. Finally add the tendrils sporadically around the design to emulate new growth. Above – when stencilling the wisteria flowers in this theme pack use Stencil Sponges to first stencil the stems and stalks in the centre of the flower bunches and then add the flowers, stencilling in two or three colours to add extra dimension. 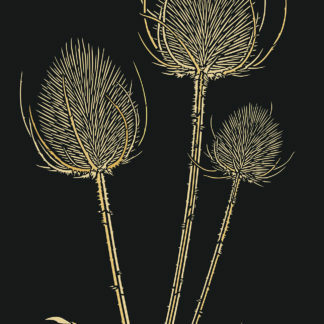 Use the same techniques for the leaves stencilling the stalks first in brown or a contrasting green and then the tapering leaf shapes in two shades – again to add extra depth to the design. Above – linen blind stencilled with the different motifs of the Large Wisteria Theme Pack in Motif Fabric Paints Bright Purple, Cobalt Blue, Light Lime, Leaf Green, Turquoise Green and Terracotta. 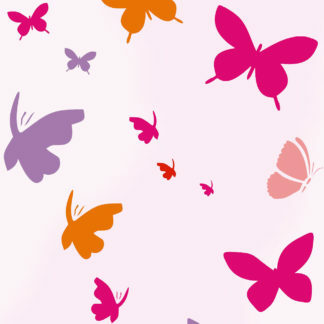 Use Stencil Sponges to blend the different colours in the flowers and leaves, using the same techniques as described above. Above – the different wisteria flower and leaf motifs of the Large Wisteria Theme Pack can be arranged in many, many different layouts – ideal for the decorator who likes to adapt designs to suit particular situations. Stencilled here simply in French Lavender, Eucalyptus and Mocha Stencil Paints. 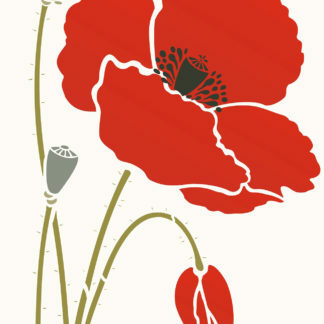 Above – shows the largest combined flower and leaf motif (centre top), stencilled over two of the branch motifs, with other individual flower and leaf motifs added around. Stencilled in elegant French Lavender, Shoreline and Arctic Grey Stencil Paints. 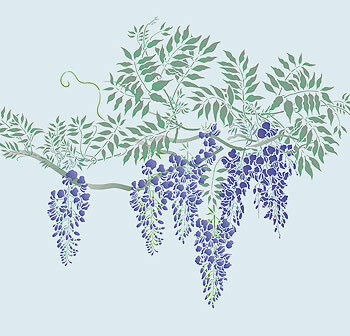 Above – the Large Wisteria Theme Pack is stencilled silhouette style on a dark grape background. All motifs are stencilled first in Ice White and then over-stencilled with Orchid and Spearmint Stencil Paints. 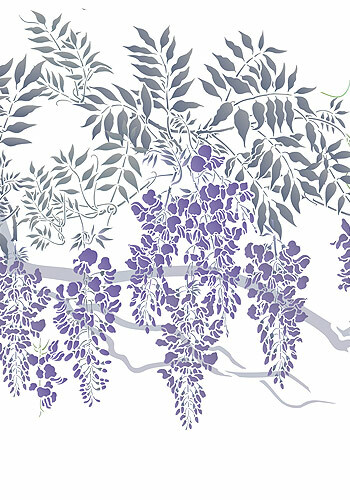 Above – motifs from the Large Wisteria Theme Pack are stencilled around the abundant flowers of the Wisteria Blossom Bough Stencil in subtle monochrome colours of French Lavender and Agapanthus on a lilac background. Tips for stencilling this stencil. 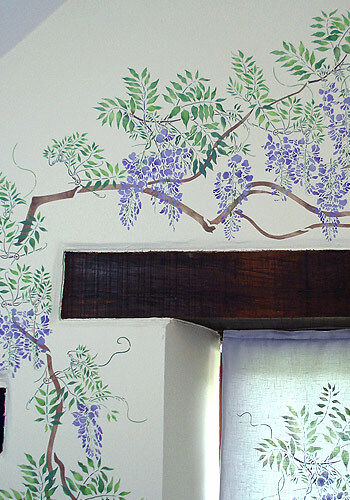 To stencil the Large Wisteria Theme Pack, create a framework of branches and twigs, stencilling these first in your chosen colours, then add the combined flower and leaf motifs a little above the branches. 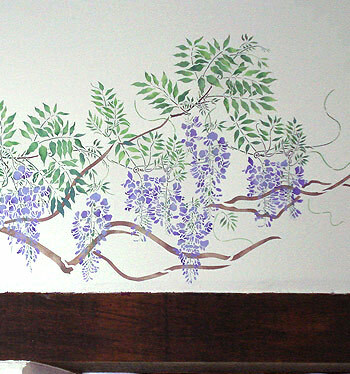 Then add the individual flower and leaf motifs, placing the flowers either on their own or in clusters around the other motifs to create the thick opulent flowering so common in climbing wisteria in bloom. Finally add the tendrils sporadically around the design to emulate new growth. Stencil the branches, twigs, leaves and flowers in one or two colours each to create extra dimension to the design and a sense of light and dark. Easy to use one layer three sheet stencil made of 125 micron mylar. Two flower and leaf combined motifs, measuring up to 52cm (20 1/2″) tall x 49cm (19″) across and 34cm (13 1/4″) tall x 31cm (12″) across. Four individual flower motifs, the largest measuring up to 31cm (12″) tall x 11cm (4 1/4″) across, the smallest 15cm (6″) tall x 7cm (2 3/4″) across. Three different leaf groups, the largest measuring up to 42cm (16 1/2″) across x 25cm (9 3/4″) tall, the smallest 12cm (4 3/4″) tall x 18cm (7″) wide. Three individual leaves from 14cm (5 1/2″) to 7cm (2 3/4″) tall. Four individual tendril motifs up to 19cm (7″) long. Six branch and twig motifs, the largest measuring up to 58cm (22 3/4″) long, the smallest 19cm (7 1/2″) long. 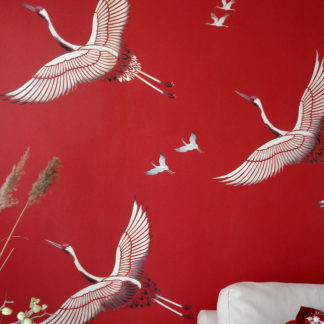 Two large sheets sized 90cm (35 1/2″) tall x 60cm (23 1/2″). Medium sheet size 60cm (23 1/2″) wide x 35cm (13 3/4″). Left – shows the layout of the three stencil sheets of this large theme pack. Shipping costs for this stencil are for Royal Mail 1st Class Signed For Delivery for the UK, which means 1 – 2 day delivery (after despatch) for UK customers and that the item will need signing for. Shipping for Europe, the USA and all international destinations will be by the Royal Mail International Tracked and Signed For Service, which means delivery 5 – 7 days after despatch for Europe and up to 10 days for US, Australia and other international destinations. Your order will need signing for on receipt. Email confirmation of delivery type is sent to you after ordering. We despatch on Mondays, Wednesdays and Fridays and accept orders up to 12pm on day of despatch for despatch on that day.